Rated PG-13 for some sci-fi adventure violence. For Star Trek fans, the second remains the best. Just as many partisans think that 1982�s Star Trek II: The Wrath of Khan provides the finest cinematic adventure from the cast of the original series, many also find 1996�s Star Trek: First Contact to be the top film to star the crew of Star Trek: The Next Generation. 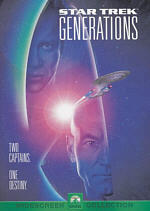 Personally, I can�t readily choose between First Contact and 1994�s Generations. Many fans loathe the latter, but I think it offers a very intriguing and satisfying adventure. It comes across as deeper than Contact, but the latter provides a stronger action experience. At the start of Contact, the Borg begin a long-feared invasion against the Federation, and they head toward Earth. Because Captain Picard (Patrick Stewart) once became a captive of the Borg, his superiors fear that his brief indoctrination will betray him, so they order the Enterprise to patrol the Neutral Zone to ensure the Romulans don�t take advantage of the Borg strike. When Picard hears the battle, however, he goes against his commands and takes the Enterprise to Earth. There his knowledge of the Borg aides the fight, and the Federation destroys the Borg cube. However, an escape sphere gets away and goes back in time. There it changes events so that the 24th century Earth contains only Borg. The Enterprise then heads back in time to stop the sphere before it enacts these changes. That leads them to April 4, 2063, the day before �First Contact�: the initial meeting between humans and extraterrestrials. The ship destroys the sphere before it does much damage, but some Borg get on-board the Enterprise and start to infiltrate it. Picard and Commander Data (Brent Spiner) head up the attempts to stop the Borg and their Queen (Alice Krige) while Commander Riker (Jonathan Frakes) leads the delegation on Earth. They need to make sure that Zefram Cochran (James Cromwell) finishes construction of the Phoenix, the ship that will achieve warp speed and attract the alien visitors. Although both First Contact and Generations feature some form of time travel, the two films seem nothing like each other. As much as I liked Generations, I�m glad Contact didn�t just rehash its story. Indeed, Contact provided a very distinctive experience in its own right. Some of the elements that take place on Earth reminded me of Star Trek IV: The Voyage Home. That film also sent the Enterprise into the past to save the future, but the similarities mostly end there. Voyage adopted a heavily comedic tone, whereas Contact doesn�t indulge in nearly as much levity. It gets a few laughs, and Cromwell�s nicely droll turn as Cochran lightens the tone, but I felt pleased that it didn�t ladle on the humor. Trek comedy comes best in small doses. Actually, Contact spans quite a few genres. In addition to the light comedy and standard action, it provides more than a dollop of horror. Essentially, the movie maintains a modestly comedic tone while on the Earth surface and it becomes dark and foreboding on the Enterprise. Director Frakes nicely jumps between these two sides of the film and integrates them smoothly; the changes in pace never feel awkward or gratuitous. Ultimately, First Contact provides a very satisfying Trek adventure. It�ll probably never be my favorite of the series, but it does most things right and comes across like a fun and exciting piece of work. 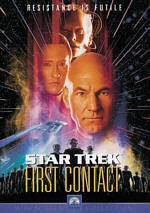 Star Trek: First Contact appears in an aspect ratio of approximately 2.35:1 on this single-sided, single-layered DVD; the image has been enhanced for 16X9 televisions. One of Paramount�s very first DVDs, the picture has held up well over the last four years or so, but it showed a few too many problems to deliver consistent excellence. Sharpness looked solid. The movie always came across as distinct and accurate. I noticed virtually no signs of softness in this tight and detailed image. Neither jagged edges nor moir� effects caused problems, but I did notice some light edge enhancement. Print flaws also created some small concerns. I detected a few bits of grit and a moderate number of specks. Colors seemed natural and distinctive. The movie mostly offered a dark palette, but the tones came across as vivid and lively from start to finish, and I witnessed no issues related to the colors. Black levels also were deep and rich, while shadow detail appeared appropriately thick but never too dark. Lose the speckles and edge enhancement and First Contact would offer a first-rate image, but as it stood, it landed a �B+�. The Dolby Digital 5.1 soundtrack of First Contact worked very well. The soundfield matched the expected level of activity. Music showed good stereo presence, while the effects created a lively and involving sense of atmosphere. Action segments boasted fine usage of all five speakers, and the rears contributed a lot of useful material. Elements seemed appropriately located and delineated, and they moved smoothly across the spectrum. Audio quality seemed solid. Speech remained distinct and natural, and I noticed no problems related to edginess or intelligibility. Music sounded bright and dynamic, with good range and clarity. Effects came across as tight and accurate, and they displayed clean and deep bass response. In the end, the auditory experience of First Contact lived up to expectations. Unfortunately, the DVD includes almost no extras. We find two theatrical trailers and nothing else. Eventually Paramount will fix that issue when they release a special edition of First Contact, but this version remains bare bones. One of the better Star Trek films, First Contact provides a consistently satisfying affair. It mixes action with comedy and horror and comes across like a winning and engaging piece of work. The DVD provides very good picture and sound but lacks any substantial extras. Fans who don�t care about supplements should go ahead and pick up this release, as it features high-quality visuals and audio. Paramount probably will put out a First Contact special edition in 2004, so those who crave extras should just wait for that package.